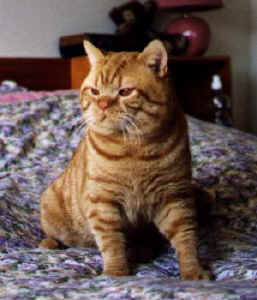 The kitties featured on this page have assisted us in our breeding efforts over the years. This is our way of thanking their human parents for their assistance! But his family calls him Rory (which is much easier to pronounce by far!) Rory lives with Colin and Jo Cornwall of Truebrit cattery in Bremerton, Washington. He sired four lovely kittens with Chauncey. You can look at two of the kittens' photo album pages by clicking on their names: Jiggy and Rudy. 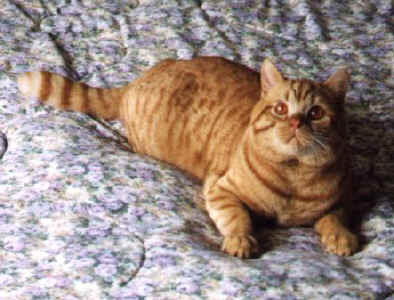 Rory is a red mackerel tabby boy who originates from Wales. He comes from the same cattery as Aggie, but from different parents. Rory is a Grand Champion and a real hunk of male cathood! To make matters even better, Rory recently earned a Regional Award for the Northwest Region of CFA. Way to go Rory and his "parents," Colin and Jo Cornwall. These photos were taken of Rory when he visited our house in 1998. 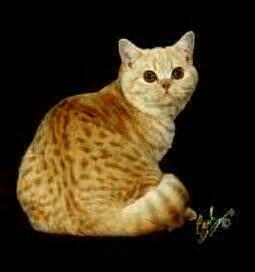 Meet Liberty, a wonderfully cute cream spotted tabby male bred by my friend, Karen Noble, of Devonrose Cattery. Karen has since retired from breeding, but we appreciate her help before calling it quits! Liberty recently passed away, but he had a big part in creating Patty Cake's litter that produced Claudine and Simone . We know that he is sorely missed. Thanks, Karen, for sharing your wonderful boy!